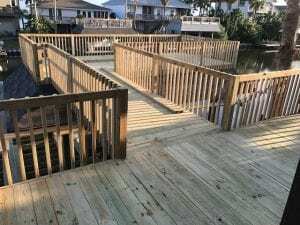 Here at DeckStainHelp.com we take pride in the fact that we have become the Internet’s number one reference for all things exterior wood and deck restoration related. 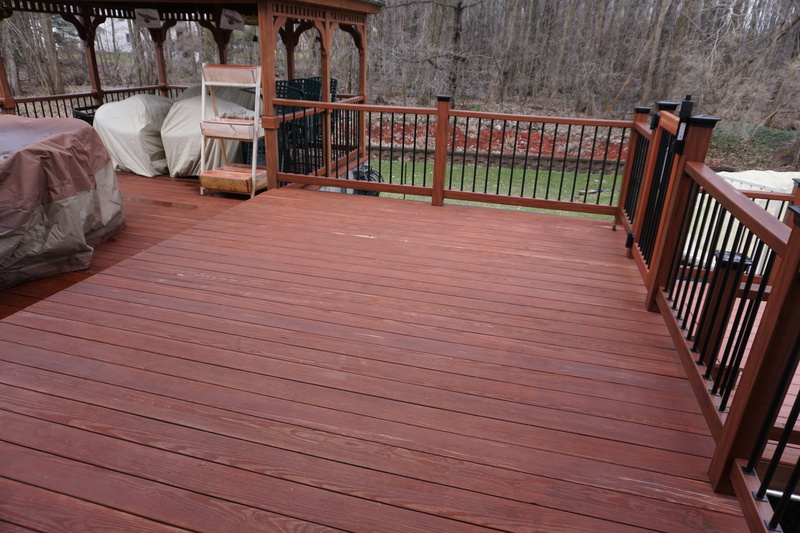 Our customers who have used Armstrong Clark wood deck stain continue to be satisfied by the appearance and longevity of their deck stain projects. 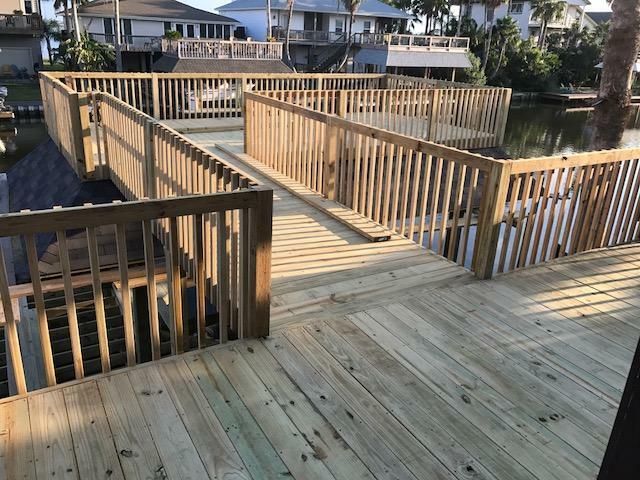 If you have used Armstrong Clark wood deck stain, we appreciate your input, so feel free to leave a comment below and pictures of your completed projects if you have them. New this year for Armstrong Clark is the Espresso Semi-Solid color, a rich deep brown tone that promises excellent UV resistance. Important Note: This is our 3rd Review of Armstrong Clark Stain. 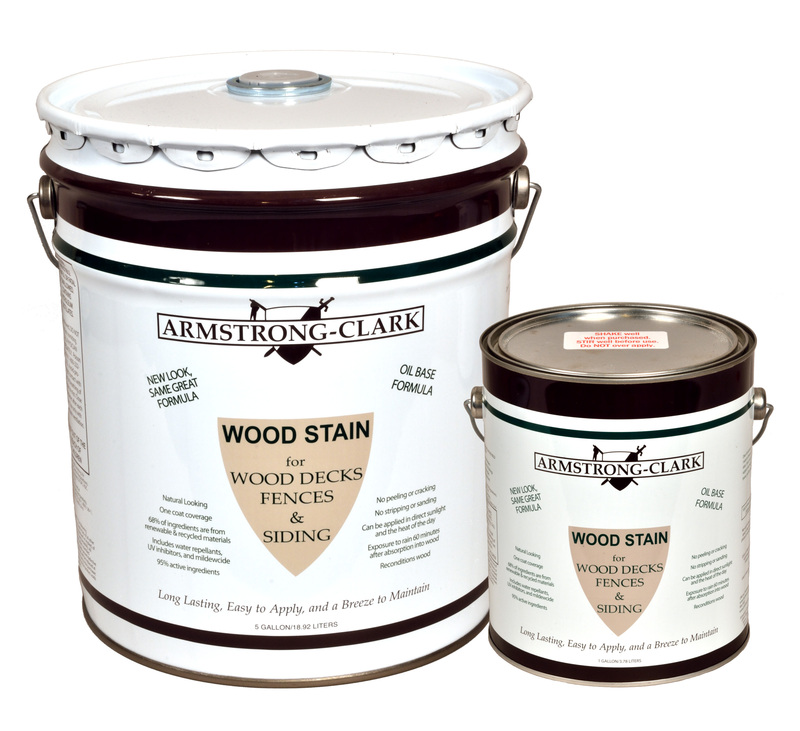 Armstrong Clark Wood Deck Stain is a highly regarded oil based stain formulated with 5 generations of stain industry experience. Armstrong Clark is available in several formulas: Transparent, semi-transparent, and semi-solid colors. 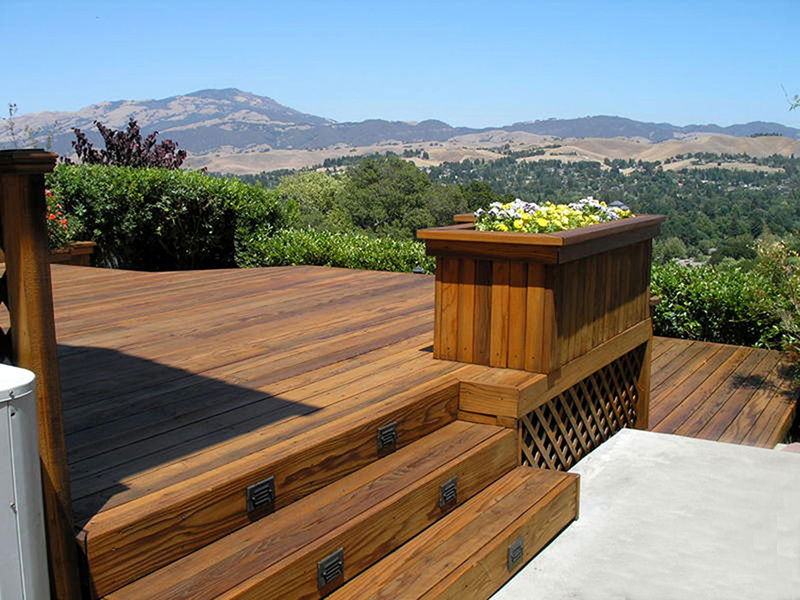 Armstrong Clark Deck Stains are uniquely blended with drying and non-drying oils that isolate from each other during application. The non-drying oils penetrate the wood fibers and help rejuvenate and condition lost natural oils while the drying oils cure on the surface to lock in the conditioning oils and form a barrier of weather protection at the surface. – The initial appearance of Armstrong Clark was a rich deep finish with naturally enhanced wood grain showing through the semi-solid formula. Our choice of the Cedar Semi-Transparent color had a rich cedar tone. 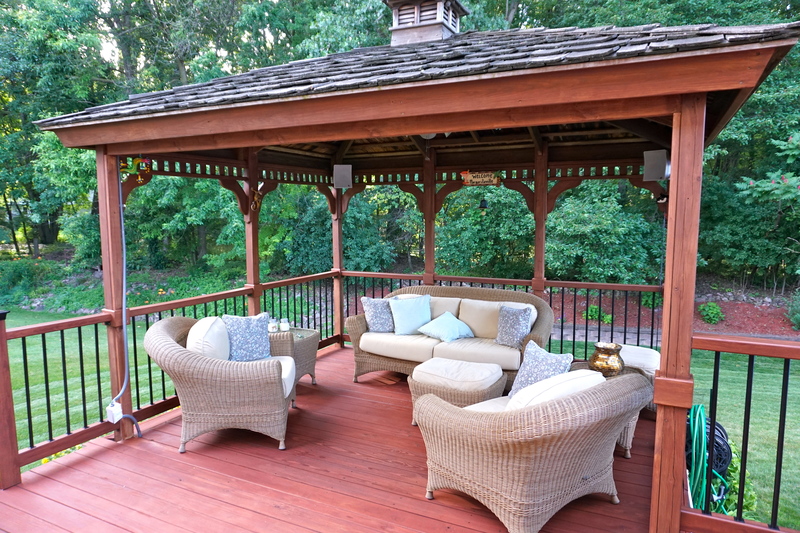 – Upon our 2-year inspection, Armstrong Clark Wood Deck Stain produced above-average UV resistance. Being a semi-transparent Cedar color we projected better than average UV shielding and it did not disappoint. It would seem to us that the transparent colors would deliver slightly less UV shielding due to less pigment in the formula, while the semi-solid colors of the AC would have slightly better UV protection when in full sun. – No peeling was detected at the 2-year point. There was a slight wearing on the high traffic areas, around the furniture, and on the stairs. 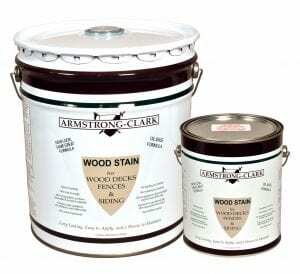 – Armstrong Clark Deck Stain can be purchased for $38.99-$45.99 depending on the opacity of the formula. In our test experience, Armstrong Clark had one of the best spread rates of any stain. We used a total of 3.5 gallons on our 600 square foot deck applied in one coat. – At 2 years we noticed some slight mold growth on top of the Armstrong Clark stain in some shaded areas. We did not detect any mildew spores within the stain as the mildew spores could be wiped away using a wet towel. – The Armstrong Clark Deck Stain was super easy to apply and extremely user-friendly. Upon the manufacturer’s claims of being able to apply in direct sunlight, we tested our application on a 90-degree day in full sun. 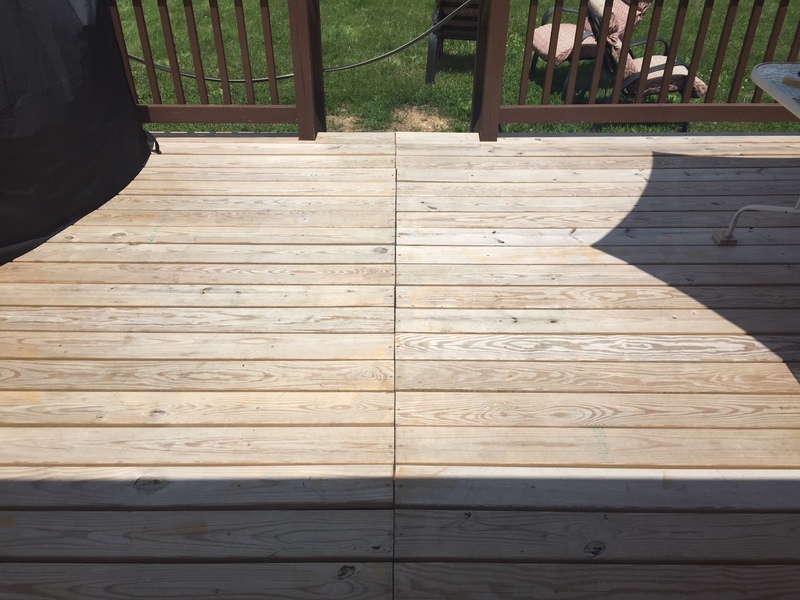 We were surprised the stain did not dry too quickly and applied evenly in those conditions, avoiding potential issues with Applying a Deck Stain in Full Sun. There were no excess dripping issues on the railings even though we applied using a pump sprayer and back wiped with a stain brush. The semi-transparent stain applied well using this method. – Our 2-year test of Armstrong Clark Stain in Semi-Trans Cedar color did show signs of slight darkening from its original color. We figured this was likely due to a higher solid content of the formula. The AC is over 70% solids, containing both linseed and paraffin oils. 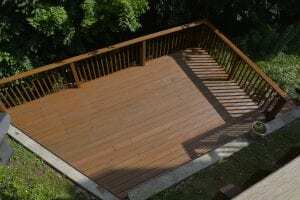 – Because Armstrong Clark Wood Deck Stain penetrates well and did not overly darken it would be easy to recoat. A simple cleaning with a wood deck cleaner to remove dirt, grime, and mold spores would be plenty sufficient prior to reapplying. – Armstrong Clark Wood Stain held up well at our 2-year test mark. Easy to apply and terrific coverage rates, raise Armstrong Clark to a high level. No peeling and only a slight darkening color shift were more than acceptable. Easy to maintain and prep prior to recoating. Armstrong Clark is definitely one of our top choices for a professional durable finish that lasts and is easy to work with in the future. Extremely impressed with this stain. After a backbreaking job of sanding and brightening the cupped pressure treated 7’x28’ front porch and four 5’ wide steps, I was praying the finished product would be worth it. I wasn’t disappointed. A complete transformation. Very easy to apply, and huge bonus not having to time application to avoid the sun. Used two coats applied only about 20 mins apart but dries enough in that time to not have worries about leaving shoe imprints on previously coated surfaces. Finish was rich and smooth. After almost a year signs of wear are minimal, and only on steps used to drag bicycles and scooters up and down in addition to very heavy foot traffic. Do you have any pictures to post? I’m out of town for a couple of weeks but can get take some pictures when I return and post them at that time. I never think to do a before and after. If you had seen the before, you’d be amazed by the after. Afters would be great. Thanks! 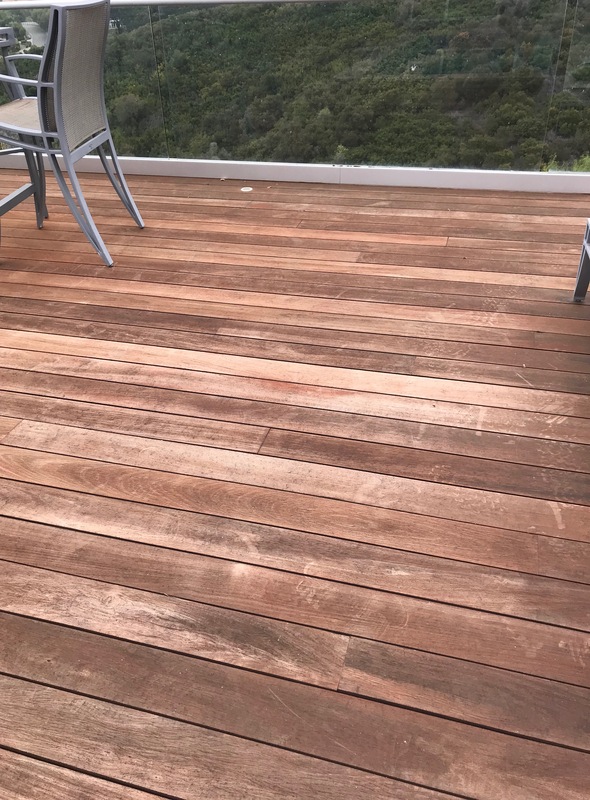 Is there a way to clean my redwood clear heart deck using a low psi pressure washer in between times when it is stained? It will be stained with an oil-based stain-either TWP 1500 series or Anderson Clark semi-transparent wood stain. The prep will be stripping, brightening and some sanding. I don’t want to harm the wood or the stain. Not with a deck cleaner or pressure washer. Try warm water and a little bit of dish soap. 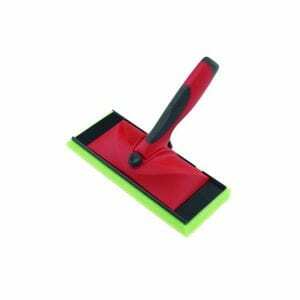 Use a soft bristle brush, similar to the ones you use to wash a car. My clear heart redwood deck is being stripped, brightened and sanded in some areas with additional cleaning and brightening after the sanding. It will then be stained with an oil-based semi-transparent stain-either TWP 1500 series or Anderson Clark semi-transparent wood stain. I live in California with many trees surrounding the deck and pine needles falling on the deck-not to mention the pollen. Is there a safe way to use a very low psi pressure washer to clean the deck in between the times when it is again prepped and stained? I need an efficient way to clean it without harming the redwood and the stain.Thank you! I just purchased AC semi-transparant Chestnut. two questions, I assume the wood needs to be completely dry, for example, it’s supposed to rain on Friday in southeast VA. I will probably have to wait until Sunday for complete dry? Secondly, how soon after application can it be walked on and rained on? Yes, 48 hours after prep or heavy rain for the wood to dry. 8-12 hours for rain after applying. 24 hours for foot traffic. Thanks. How long to wait to stain after using RAD Brightener? It’s year 4 for my deck and it’s showing wear and tear. I feel this product is a great product! So easy to use, can apply in the sun and looks fabulous when finished. Hello, what is your preferred oil-base semi-transparent stain? 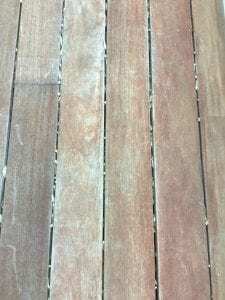 Armstrong Clark Deck Stain? Do you prefer it to Sikkens? We do not care for Sikkens. AC is a great oil-based stain. Hi there. 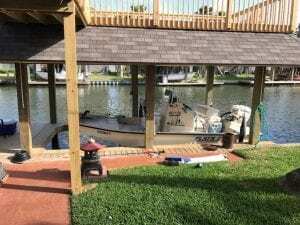 We have a Mahogany deck that we sand and finish every year. We end up trying a new product every year because pretty much every product that we try fails in some way. We used TWP last year and halfway through the summer, it was as if we hadn’t put anything on the deck. We did all of the steps–cleaner, brightener, etc. We do live on the water in Massachusetts, and the deck is in full sun. We are looking for a transparent product that won’t leave black gunk as the product starts to break down, and that has some staying power. We expect that we will continue to have to sand and treat every year, but we would hope that whatever we use would last for more than 2 or 3 months. Also, ideally, we would like a product that has some sheen to it vs. flat without any sheen, which seems to be the case with most products. Back in 2008, we had a product that was so beautiful–a clear product with no yellowing that left a sheen like an interior hardwood floor. I suspect that whatever it was that we used was no longer available due to emissions/EPA reg’s. Can you help–what product should we try this year? 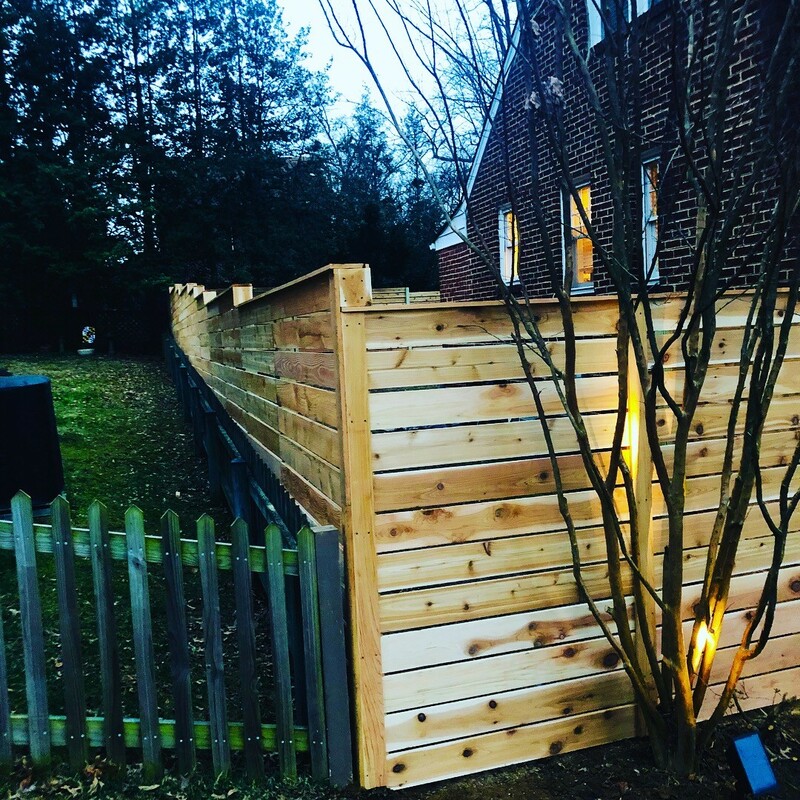 I installed my cedar fence about 3 months ago. I’m thinking of using Clark’s semitransparent cedar color. 1.What is the best way to apply? If using a brush and rags — what’s the best brush to use? If spraying what’s the best sprayer for this stain? 2. I have about 250 linear feet, 6 foot high horizontal fence — how many gallons do you think I would need? 3. Do I need to clean the wood before applying the stain, or is it okay because it’s only been up for 3 months? By the way, wonderful website! 1. Use a stain pad or brush. Just one coat for new wood. 2. 3000 sq feet when doing both sides. 15-20 gallons. 3. Yes. Clean and brighten the wood. With regard to cleaning the fence, is there a product you recommend and do I need a pressure washer to rinse off? 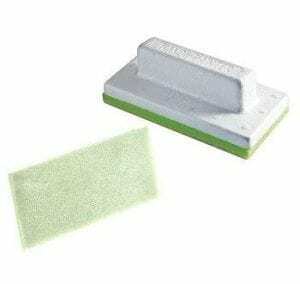 Are there any brands you recommend over other with regard to stain pads and brushes? 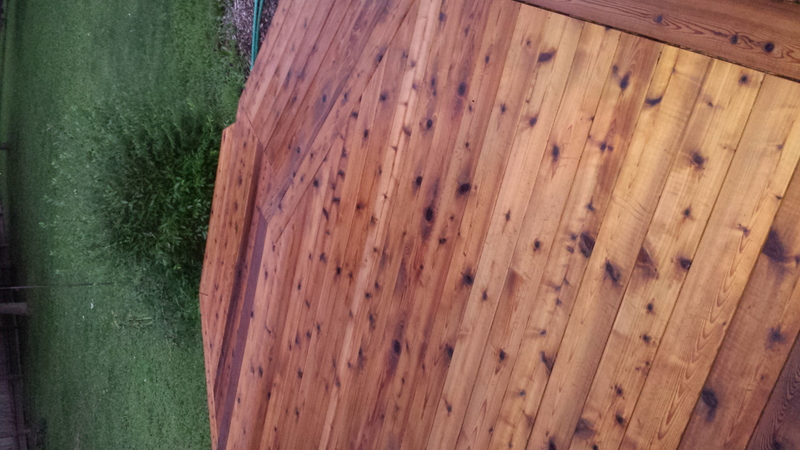 In your professional opinion do you think this is the best stain for cedar? With the prep, try Restore A Deck Kits. Apply and pressure wash off. Shurline pads work well. AC would work very well. Thank you! 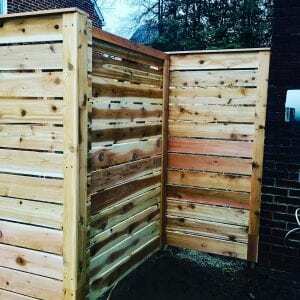 My cedar fence has a smooth and rough side — do you think I should use a brush for the rough side? Also, the head of the team that installed the fence told me not to use a pressure washer for the smooth side because it might make it rough — not sure what your thoughts are on that! You can use a pressure washer at low pressure when using the prep kits. Stain pad or a stain brush will work. 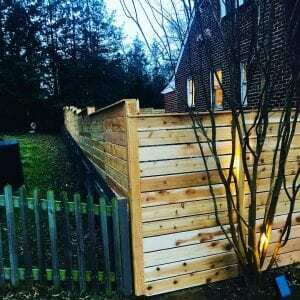 Installing a new cedar fence in Washington, DC and thinking of using semitransparent Armstrong Clark Wood Deck Stain. Do you suggest 1 or 2 coats? 1 coat for new wood. 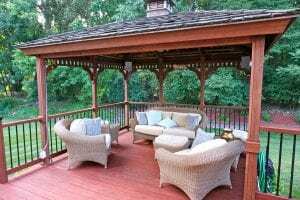 My husband and I have a Cumaru deck and Cumaru floor in a screened porch of a house at Lake Norman (western Piedmont NC). The Cumaru had been beautiful when new; the contractor had used Ipe Oil on it originally. After two years, it was time to treat the Cumaru deck. After much research, particularly impressed with your site, my husband and I cleaned, brightened, and stained our deck. It was a lot of work, and immediately we were disappointed. The semi-transparent Mahogany Armstrong Clark stain made the wood look cheaper with the color change and had no reflectivity. It looked as it needed oil and looked nothing like, or not as beautiful as the original Cumaru. We could compare easily by looking into the porch. It’s time to redo the deck, and again, we’re researching what to use. Based on your reviews, Armstrong Clark seems the best. Is there anything we can do to revive the wood, make it look alive, and not so dried out as it appeared when we finished the job first? This time, we also need to treat the Cumaru in the screened porch. I’ve been tempted to try applying linseed oil, to provide the wood some oil. I was unsuccessful in uploading a photo of the Cumaru in our screened porch (now 5 years after original installation, no treatment since). 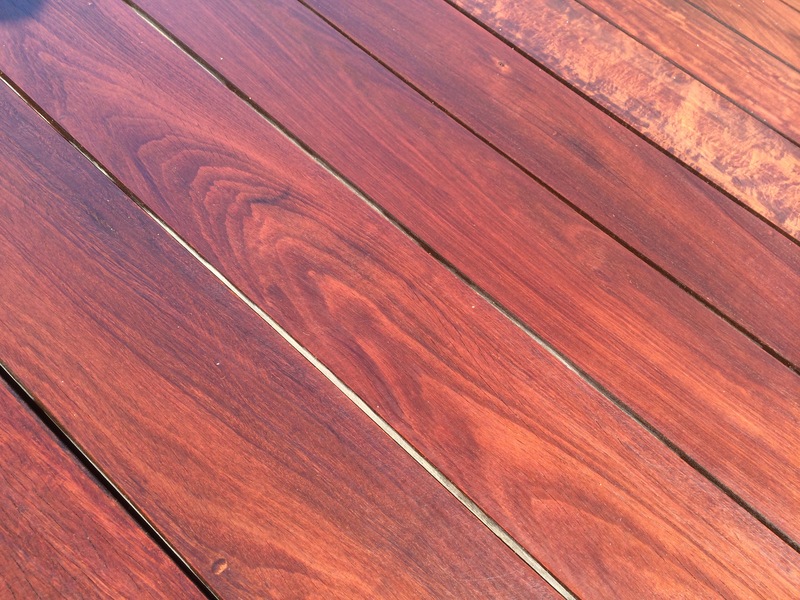 Attached is a photo of a section of the deck, two years after the mahogany stain. It was much smoother when completed but just as dry looking as in the photo. Please advise. Thank you. We appreciate the research and replies to the posts so much. Prep with the Restore A Deck Kits and then stain with the AC. Use Amber this time if you want less “red” and more of a rich wet look to the Cumaru. No need to apply linseed oil plus that will attract mildew as it will not contain a mildewcide like the AC. Will the Amber look wetter and less dried out than the mahogany? Or, is it something that the Restore A Deck kit will do? Thanks so much for the prompt advice! Not sure what you mean by wetter. Both are penetrating stains that will enhance the natural wood grain based on the color you choose. AC will not leave a shine. The RAD will prep the wood. I am looking for a concrete stain.Most of the reviews are not very promising. This is a wood restoration site, not concrete. Question- I just purchased a house in Minnesota and they had a large deck just built in July of 18. The floor boards are a treated pine and the railing is cedar. Should I be staining the cedar railing before winter to avoid it turning brown or Black? Temps are in the 50s. Sounds like the treated part I should wait until next summer. Do it all in the Spring. Clean and brighten the wood first. cedar fence rough. built about 11 months ago. no stain or anything applied yet. bare. Live in Fresno, Ca. Can you give me your best guess on the color of pic 1 taken from Armstrong Clark website? Guessing its either natural oak, rusted brown, or cedar. I cannot get samples because I’m facing a fine from my HOA and no time .Have to order blindly. The pic looks like smooth cedar and I’m assuming a higher grade wood than mine lol. Anyway, I’m not that picky, I just rather have the medium color like pic 1 or pic 2. Pic 2 is not from Armstrong Clark. Its just an example of a close match to what I would like to achieve. I do not like a fence that looks orange or yellow, but I also rather it look close to pic 1 or 2. Can you give me your best guess? If I use the AC, I only need 1 coat correct, because its the first time applying anything? If I did choose to do a second coat, how long would I need to wait, 1 or more days? Awesome site. I bet you get tired of repeated questions. First one looks like semi-transparent cedar. The second one looks like Natural Tone. 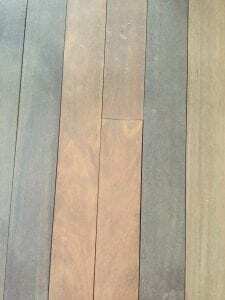 Wood colors will vary based on the type of wood that you have. Also age. 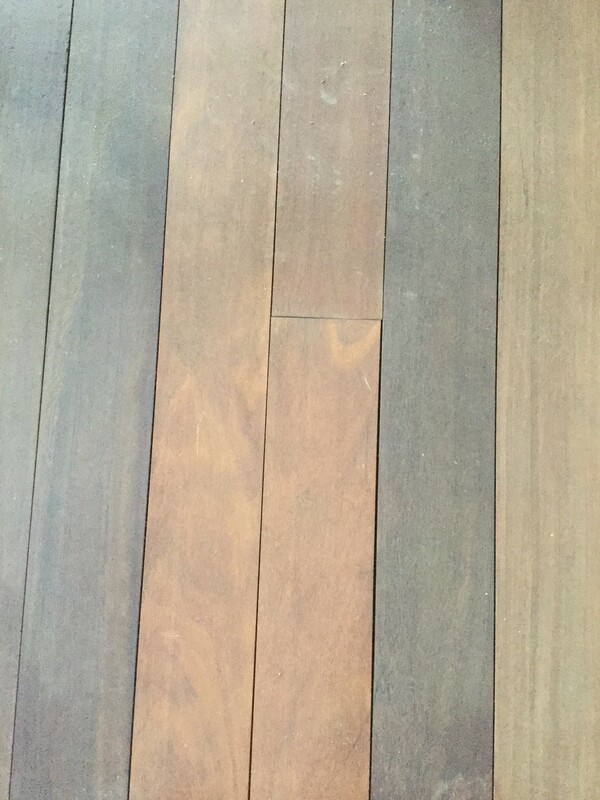 Older wood is more absorbent and will have darker colors when stained. Typically two coats. Wet on wet application. Hello. 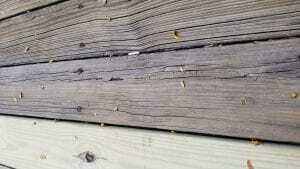 I have a 10 year old previously stained deck I am cleaning and refinishing. I am about a week away from finishing the cleaning/stripping part. It is now September 1. 1. Am I too late in this season to apply to the Armstrong-Clark semi solid stain? (I live in Spokane, Washington and temps are going to be around 75-50 degrees. It will take a few days to apply the stain. 2. 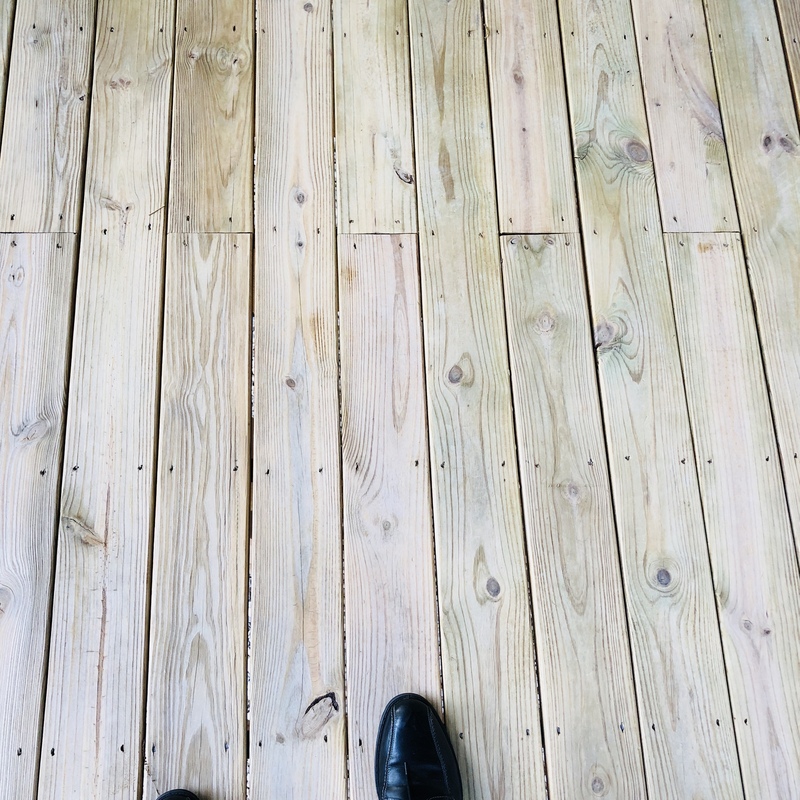 If I do not apply this season, can I just leave the deck unstained and uncovered? 3. If I do not apply this season, what will I need to do next year to stain? You have a great site and thanks in advance for your help! 3. Clean and brighten the wood next year. Have used Armstrong semi-trans twice now. It looks great after application, but one winter and it fades dramatically, on an east facing cedar deck, with minimal foot traffic. Disappointing, moved into our new home in 2015 and it needs a 3rd application in 3 years. I can buy stain at any big box store and get that length of life. Do you have a picture? You might be doing something wrong as you should get a couple of years with minor fading through the years. 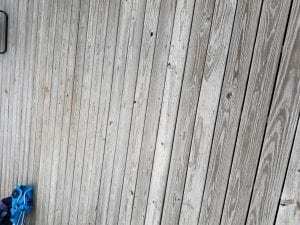 My deck is about 20 year old pressure treated wood with nothing on it, morning sun/afternoon shade in Cincinnati. I just had it pressure washed and the worst boards replaced with new lumber. 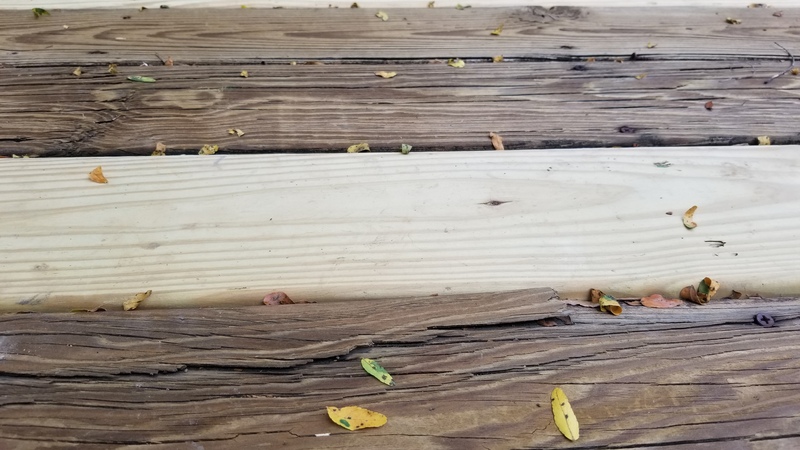 Looking at the remaining boards in the photos, would you recommend I replace all the decking and stain next spring (planning on Armstrong Clark rustic brown), or will the AC oil be able to revive the old planks where they’re cracking and splitting? Thanks. Replace all flooring and do the prep and stain in the Spring. our pool deck is currently treated with Penofin- blue label oil based semi transparent stain. 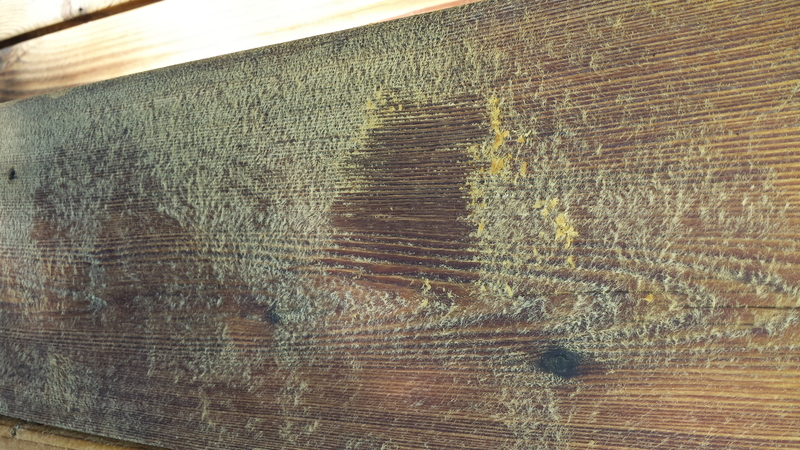 We have used this product for 20+ years but would like to switch to a sealing stain to better protect the older wood. 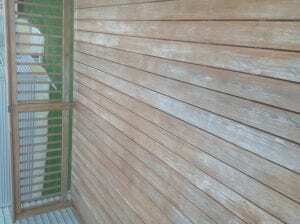 After stripping and sanding our deck is there any other prep we need before applying your semi transparent stain? Make sure is removed and then brighten the wood for final prep. I’ve used the semi transparent stain twice now. Lasts three years, although it does fade and could be redone after two years. Love the ease of application and no peeling. The only negative is that even after months from application, walking on it will give a tinge of color to your foot or shoe. We used the cedar semi-transparent on a deck that had been ignored for at least 15 years. After a good cleaning the stain turned what was old, battered, and completely greyed out wood and brought it back to life with a wonderful color and water resistance. By far the best exterior stain I’ve used. We repeat every other year to maintain water resistance and keep the old wood conditioned. It could probably last 3-4 years between applications. Installed pine decking summer of 2017. Summer of 2018 stained using Armstrong-Clark Sequoia (semi-solid). Could not have been more pleased. Stain went on easily and looked great. This is the only stain I will ever use again. would you recommend 1 coat or 2 coats, or do you think it wold be worth doing 2 coats of this product? 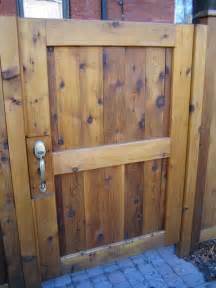 For older wood, do the 2 coats applied wet on wet. Thanks for the reply used the restore-a deck stripper and brightener today just giving it a few days to dry will be applying the Armstrong-Clark semi- rustic-brown on Wednesday. The stripper did and amazing job as well as the brightener, we wanted to use the TWP 100 but there colors were to orange and I really did not see any difference color wise between the two TPW color samples I had chosen. After reading the new 2018 2 year reviews it seems the AC product has dropped in the rating scale, hope I didn’t make a mistake in this product. No, it has not dropped in it’s overall score. AC is a great stain. 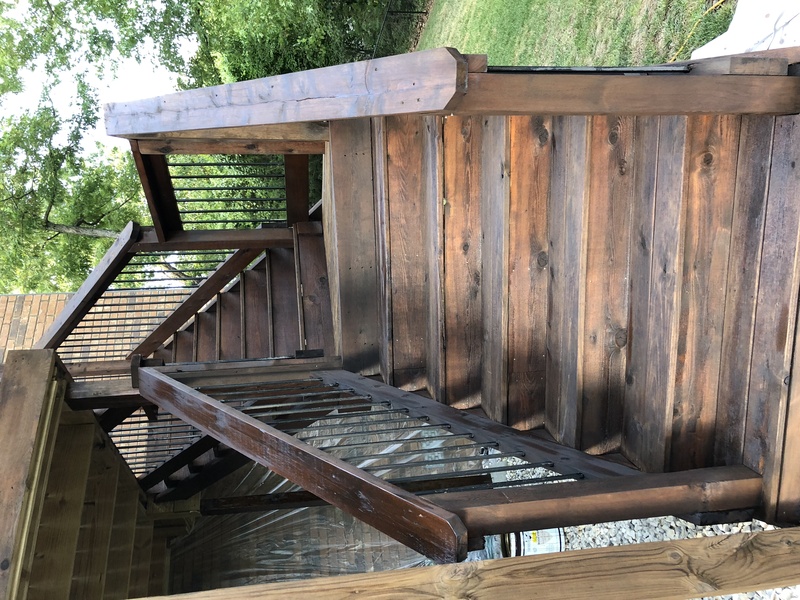 Great product this is Armstrong Clark Rustic Brown first picture is after Restore-a-deck stripper and brightener the a 2 coat application wet on wet we are very pleased it is a 2 story deck with cedar/treated pine combination. We will apply a single coat to bottom side. Really pleased so far it was brushed and rolled. just a quick question how long between coats on the wet on wet?? thanks for all your help what a wonderful and very informative site y’all are awesome!! AC is a penetrating stain, not film forming. I am installing a new redwood deck. I have sanded all the wood with 180 grit before installation. There appears to be a mix of wet and drier wood. Should I wait (how long) before stain application and prep? Is this a good choice for new redwood, or is there a better choice? I live in the San Francisco area. Sanding to 180 grit is not a good idea. It is too smooth and the stain will not soak in. This could create wearing or peeling. AC will work well once you weather and prep correctly. I used the Natural Tone stain on a cedar deck I had stripped and brightened. 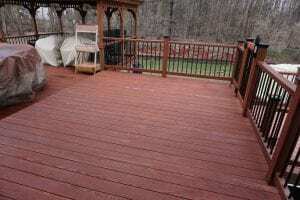 I chose the lighter tone because the deck looked good wet and that is how it looks now. The application process is excellent. The deck is in a sun/shade location and it was nice to not have to worry about the sun. The product went on, as stated, with no visible blending lines and no difference from sun or shade application. This deck absorbed alot of stain. I used 3 gallons for just under 500 sq. ft.
I’ll leave a rating after the product sees some time. So far I am very satisfied. 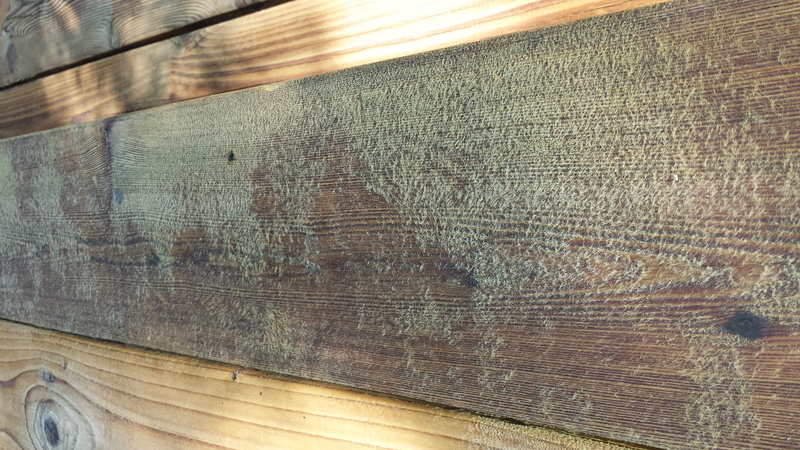 We are noticing some of the boards on the cedar deck getting this fuzz to them. It looks like raised wood grain and rubs of with my fingernail. In the stripping process I did have to use a brush to remove the old stain. Here are pics of a board. Second one is rubbed area. That is raised wood fibers. Best to buff those off. How is that done? Sander or buffer? Buffer with a sanding pad is easier. As Aline Q said, I’m also extremely impressed with this stain. It looks unbelievable on my two decks but performing the prep work was key to that. In my case I had my decks professionally done two years ago when they used Sherwin Williams oil stain and it came out fine but by the 2nd season here in Pa it was pretty much worn away. They pressure washed it but I’m not clear on whether or not they did any other prep work. The color was fine but it didn’t have the depth that the Armstrong-Clark product does. The finish had almost completely worn away and/or was UV faded and grayed after two years. I used SW’s Revive deck cleaner/brightener product, applying it on all the flat surfaces with a sprayer, waiting 20 mins and then hand scrubbing with a deck brush. Afterwards I power washed it but on many of the planks I had to go slow due to what looked like stubborn green mold in the wood. Eventually I learned how to power wash without leaving spray marks in the wood and without raising the wood grain. I also power washed the vertical spindles and posts. A few days passed before I was able start staining but I was blessed with sunny days which were either hot and humid in the 90’s or much less humid and in the 80’s. In either case I had no issue with application or drying. The tools I used included a Shurline pad and handle, a screen for the five gallon bucket and a Shurline Handi-Painter pad which worked great for staining the spindles and tight spaces in between. The decks both got two coats with overnight drying in between. There were a few wet spots but no puddling. You do need to be careful when doing the vertical surfaces if you want to prevent dripping but the hot temps may have had something to do with that. We chose the mountain cedar semi-transparent color and it looks fantastic. So far, I can’t recommend this product enough. Just want to say Thanks for providing this site. I have used it many times for product research and techniques. In the run of two large rejuvenation projects, I saved alot of dollars and hours. If our pressure treated deck was previously stained with Penofin, what do we need to do to change to AC stain? And if we want to use a semi transparent ? It was stained two years ago, areas are darkened, mildew on steps, stain appears thin. Strip and brighten for the prep. 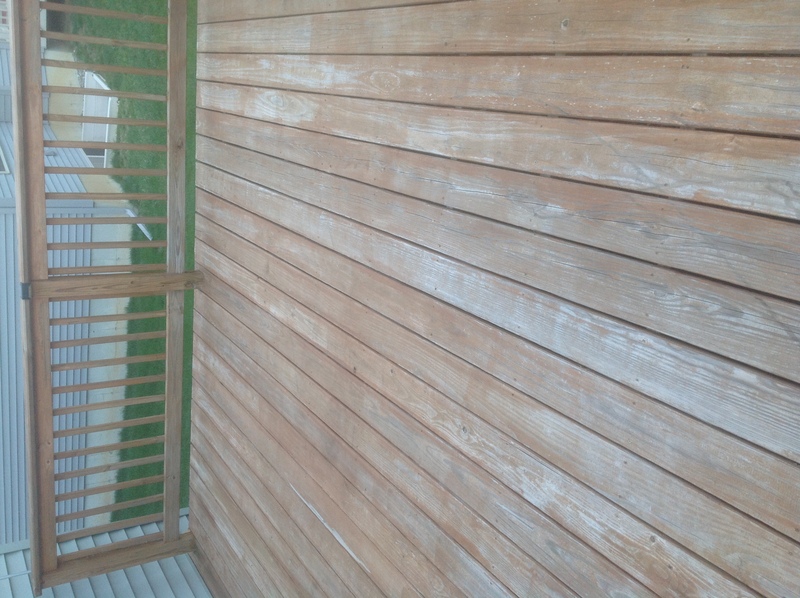 Use the Restore A Deck Stripper/Brightener Kits. 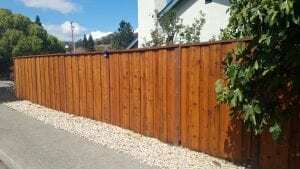 1- My redwood fence is 8-9 months old, haven’t touched it, do I need to use the gemini cleaner/brightener before I apply stain? How would you prep, pressure washer ony? 2- Would you recommend 1 or 2 coats? 1. Use both cleaner and a wood brightener while pressure washing. 2. Two light coats applied wet on wet. I have been told never to pressure wash a deck! The problem is it forces too much water into the wood and with extreme heat it can cause the boards expand quickly and crack the wood. That is not true and 99% of pressure washers use cold water. Always use the proper prep products when pressure washing though as they will reduce the pressure needed significantly. How many coats do I need for a new pressure treated wood deck? About 1 year old. Upper Northeast US. Moderate sun. Hasn’t been stained. Do 2 coats extend the life significantly, or will it need to be re-stained in the same amount of time? Clean and brighten the wood for prep. Apply two very light coats with wet on wet method. As long as thre prep correctly and remove all of the current coatings, you can go ahead and stain with the AC. I stained my deck last spring….loved it. Turned out great. But now this spring our feet turn black from walking on it even after cleaning it. My granddaughter crawls and stained all her clothes her hands feet etc brownish like the deck. What can I do? Please, very discouraged. We followed the instructions to a T.
Not sure if this issue is related to the stain or just dirt/grime buildup on top of the stain. Might want to call AC for assistance but it seems to me, it is more a result of your environment. Hi .. Have IPE deck in Los Angeles area , intense day time summer heat from direct sun 10 hours a day and dry canyon below , south east facing, 3/4 mile from ocean, usually dew on deck in morning . Have been using AC Mahogany for a few years , last applied 9 months ago. The painter uses a machine sander (unknown grit) and then applies one coat with stain pads. A little disappointed in the longevity of stain especially since this is the highest rated stain. 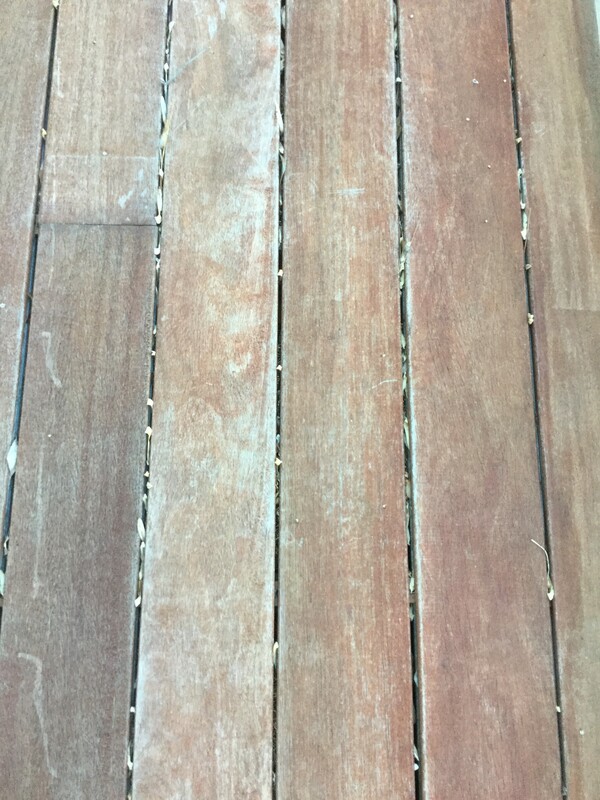 Seems like restore a deck cleaner and brightener are to be used in lieu of sanding for future applications but that seems to essentially “strip” to bare wood (as seen in helpful video)… same as sanding but perhaps easier? See photos #1 and ##3 of current state compared to second photo which shows lustrous stain after application. Or is that a waste of stain and money? 2, If above is “no” , then I assume no “stripper” is needed for reapplication of same AC stain ? 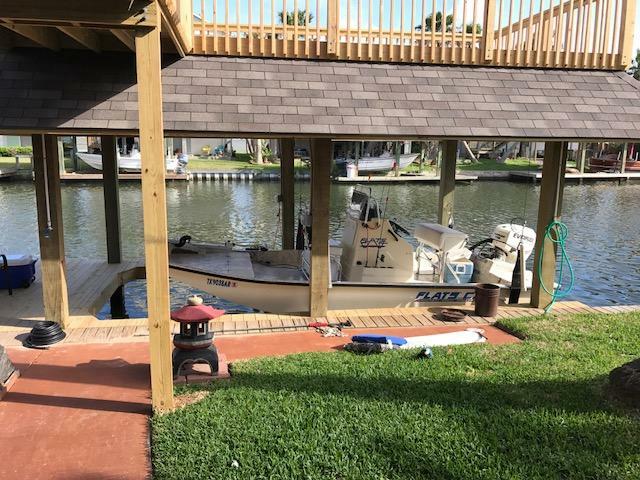 Just restore a deck CLEANER and brightener ? 3. 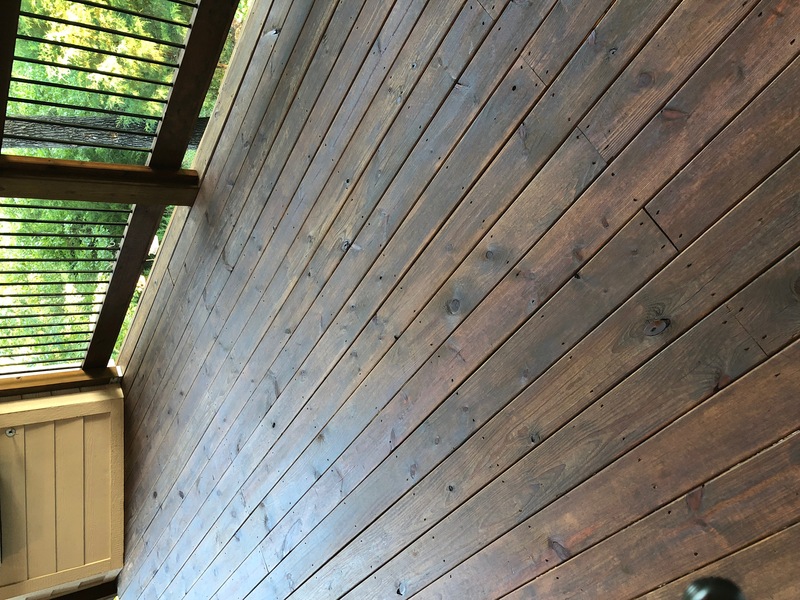 Should I simply accept the 9 month cycle with Restore a deck cleaner and brightener before restaining as the “normal” for this climate and sun exposure ? 4. Any tips to improve longevity of the beautiful stain seen in photo #2 ? The issue with longevity is not with the AC but your wood type and the intense sun you have. There is nothing on the market that will last longer. 1. 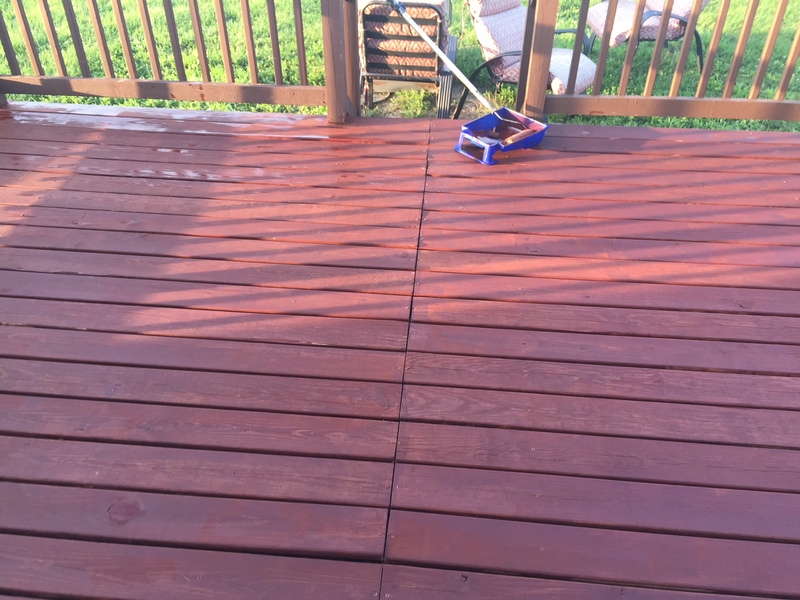 You need a proper deck cleaner for the prep, not mild detergent. 2. Use the deck cleaner and pressure washing for the prep. 4. Sorry but nothing will last longer. You can clean and brighten as needed for reapplication. FYI, stripping the AC if ever needed is as easy or easier then cleaning. Just a different product but the same amount of work. This was completed November last year. Is it ready now for stain. So do you think semi solid AC is best choice for this project? Is on saltwater canal in Galveston. Curious about runoff in water and vegetation with cleaning and brightening and when the need for reapplication and possible stripping being required. Yes on the AC semi-solid when in full sun. As for runoff, not much you can do about this when over water. 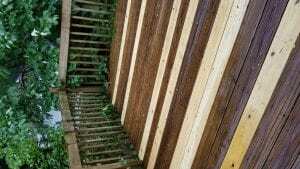 Hi, I have a redwood deck that I built two years ago. I waited until the following spring to prep it and I stained it with Armstrong semi transparent Sierra Redwood. It looked terrific but now is starting to show wear on the traffic areas. 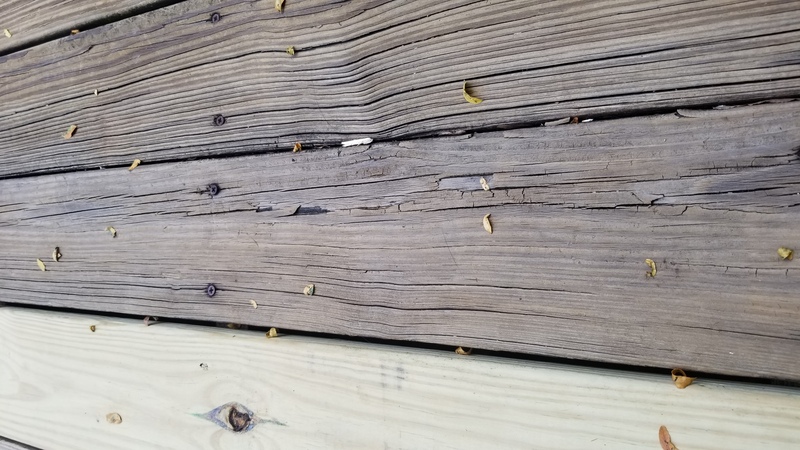 I would like to re-coat the deck and was trying to find the proper procedure.Do I have to strip it off or can I clean it and re-coat it? What products do you recommend? Thanks for your help. 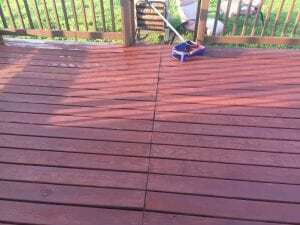 Prep with a deck cleaner and pressure washing. Brightener after. You can strip but probably do not need to. 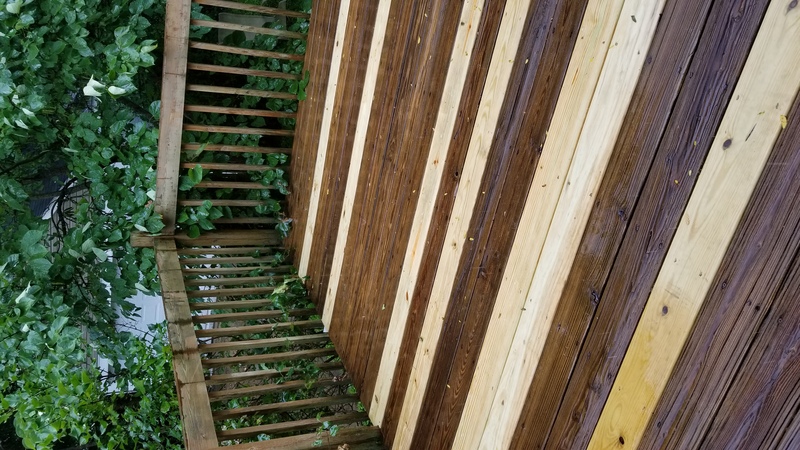 We built a new cedar deck in the fall of 2016 and let it weather until June of 2017 when we prepped the deck with Restore-A-Deck Cleaner followed by Restore-A-Deck Brightener. We applied an Armstrong Clark transparent cedar color stain. 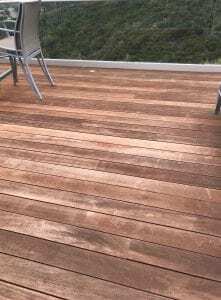 The deck looked amazing at first but it started to mildew after a couple of months and it became very dark by the end of the autumn. We have a low deck (approximately 24″) and that may have contributed to the mildew problem. I prefer the look of a transparent stain so I will strip and brighten this spring and apply a different brand of oil-based transparent stain. If the new stain fails as well, I will know that it is not the fault of the Armstrong Clark, but rather that oil based stains are not well suited for low, poorly ventilated decks. If the new stain does not fail, then I will have to conclude that the Armstrong Clark is not suited to our Canadian climate. I will post the results in the fall. I stained the deck with a water based semi transparent stain 3 years ago. I’ve previously sent pictures and was advised to clean and brighten the deck with the RAD system. I as sent the cleaner and brightener. Will that work or should I send them back and get the stripper. You have to strip and brighten to remove any old coatings. We did say to strip and brighten, not clean and brighten. Would it be possible to send the cleaner back and get the stripper. Ask the company you bought it from. I sent a picture in last week and I’m trying to find the help you provided but now it’s not showing up. Hello, we do not have any prvious posts with your email. Please try again. Just completed a KDAT Pine deck. Now can I apply AC or does it need the prep of other pressure treated Pine? Have to wait about a month and then clean and brighten the wood for the prep. I believe Armstrong Clark Wood, Deck stain is a Great product. But you have to read the instructions carefully. I have used this product and paid a pricey dollar for it . It was worth it, besides the side affects it has . If you leave it on your hands for a short period of time The chemical in it will burn you. Everytime ! Fresh Start consulting and services, INC.
Seal and it doesnt last one season. 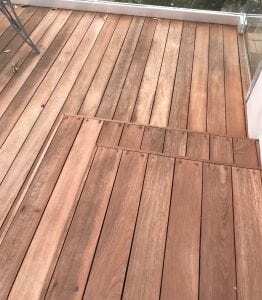 Can I use an oil base stain deck stain over it? they flaked and peeled. Pressure washed last year but have not redone them. No. You cannot use any brand over the Thompsons. It must be removed by stripping. 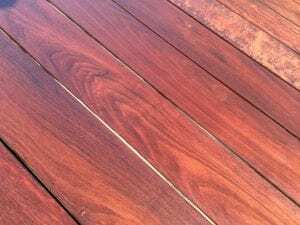 For the other decks that are solid colored stain, you can only use a solid stain again unless you want to fully sand or replace the wood. Solid color decks stains are only available in water-based versions. We have not seen a solid color oil based stain in 5-8 years. Howdy. Moved into a new house with a 5yr old 500 sq ft rooftop deck that doesn’t appear to have had any stain since it was constructed. It receives direct sunlight so is extremely grey at this point. Since it is also a bit rough to the touch, I was considering sanding. You don’t seem to advocate sanding as part of the preparation process. Would simply pressure washing, cleaning and brightening do the trick? Lastly, would you recommend the AC over the TWP1500, or are they pretty similar? I’m in DC so super hot summers, a little bit of snow in the winter. Thanks so much! No need to sand. Just clean and brighten. The AC is a great stain and so is the TWP 1500. Either would work well. 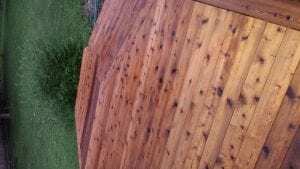 Hi, I applied AC Rustic a couple of years ago on my cedar deck and need to do a maintenance coat. I still have the RAD kit leftovers from before the original staining. I’ve seen somewhat conflicting info here as to whether I should use the cleaner only or the brightener as well before applying a maintenance coat of AC? Can I use a brush to scrub the cleaner or I need a pressure washer? Best to use both and light pressure washing. If you have time, post a finished picture. FINALLY! I waited a year before posting my comments regarding the Armstrong-Clark Exterior Wood & Deck Stain (Semi-solid Sierra Redwood) as I wanted to come at this review with at least one year of wear and tear on the stain. Having owned three houses, all with wood decks (new and old) I have had the displeasure of trying all the leading deck stain products over 35 years including recently high end stains from Olympic (Elite 4200) and Defy External, among others. All have been a total disappointment. Before you say it was my poor prep I can tell you as a retired R&D engineer I faithfully follow manufacturer’s instructions to the letter. Just my nature. The last product I used was Defy External Clear. I had high hopes for this stuff but after only 7 months it started flaking. After a hard upstate New York winter it looked terrible! This was my starting point for one more stain try before ripping up the deck and replacing it with composite. My 9 year old pressure treated deck faces SW and sees full sun for 3 months of the year. Temps range from 90 to 0 deg F with over 100 inches of snow. I sanded the entire deck surface to remove the remaining Defy product. I then used cleaner and brightener followed by a light sanding to remove the raised wood fibers then let it dry for a couple days. I applied the Armstrong-Clark stain with a brush and let it dry overnight. It went on great and the the semi-solid stain allowed the grain to show through exactly as I hoped it would. Now the wait was on. So a year later the snow has melted off the deck and to my surprise the deck looks as good as it did when I applied the stain! It is still uniform in color and just a touch lighter. Water is still beading up in most areas. Even one difficult section that habitually had green algae due to the least sun exposure over the year looks great! There are a couple very small areas around two wood knots that look grey, probably to to excess resin in the pine wood that may have leached out but overall I am extremely satisfied with this product! My hats off to the folks at AC for FINALLY giving us a product that does what it says! Keep up the good work. Thanks for your review on the AC. Do you have any pictures? Here are a couple pictures, one from last year after staining and one from this spring after the snow had melted. Haven’t put the deck furniture out yet! I used the Sequoia Semi Solid stain. I installed new red cedar deck boards on our above ground pool deck in April 2017. 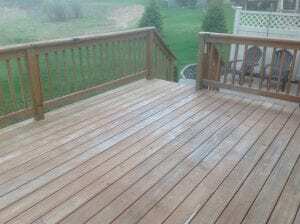 The deck has gone through one full year without staining or finishing including this current winter of seasoning. I have purchased the Restore-A-Deck kit and the Armstrong Clark semi-transparent cedar stain from you to finish the new deck boards. I plan to complete this in May or June this year. 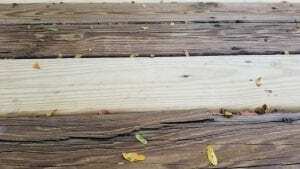 Do I need to sand the “new” red cedar boards ahead of preparing them with the Restore-A-Deck kit and then applying the stain? Hello. I have a redwood fence that was installed in August 2017 in San Jose, Ca. I am considering the Armstrong Clark product. Is it too soon to do the initial stain on this fence? Temperature when I apply will be in the 60’s now. You are good to stain at this point with the AC. Can I use Armstrong-Clark on sitting areas; Adirondack chairs? Yes. We use it on benches all the time. Can I apply the Armstrong Clark over a TWP stain, or do I need to strip it? 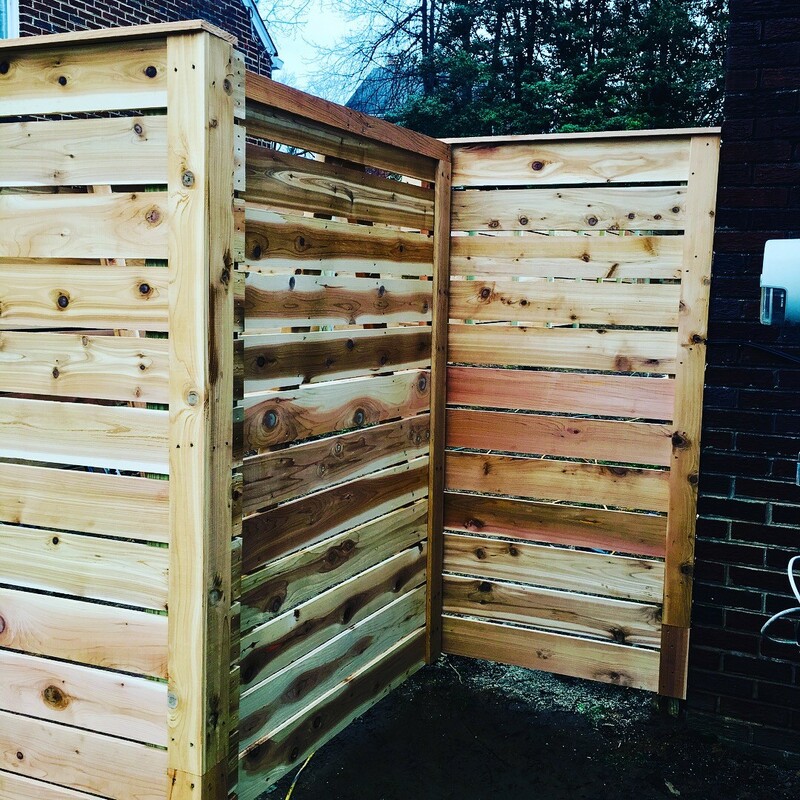 We’ve had some problems with mildew on our cedar fence and would like to try something different. Definitely don’t want to strip it – went down that road after dealing with Arborcoat. Are semi-solid stain less susceptible to mildew? Thinking something darker as well. Thank you! You will need to strip it. The good news is that TWP is easy to remove. Just apply a stripper like the RAD stripper and pressure wash off. Neutralize with a brightener after. No harder than cleaning with a deck cleaner. Semi-solids will not do any differently with mold prevention. They will offer better UV protection. 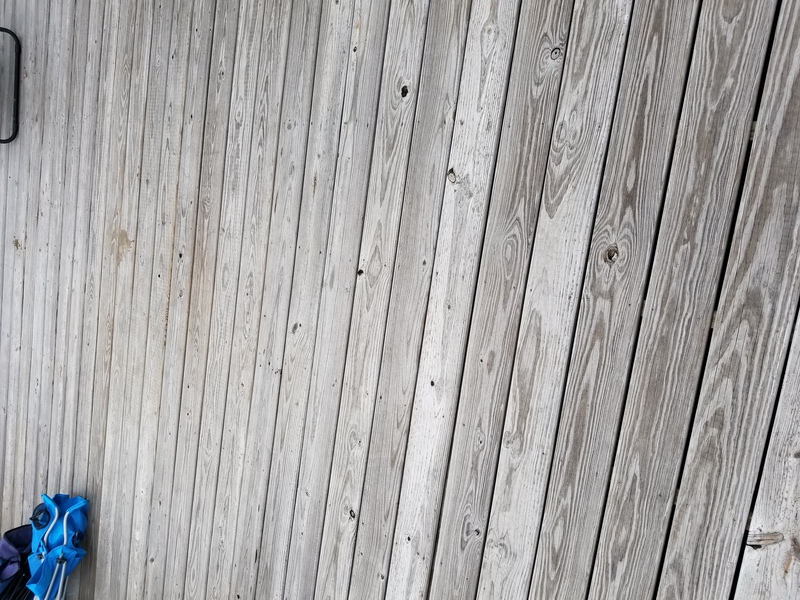 I really want to stain our new deck gray, but I’m having trouble finding a good quality stain with a gray color that actually looks gray (most seem to have a brown tint). I live in Michigan. I’ve already prepped the deck, so I’m raring to go, but finding a good quality stain is slowing me down. Any suggestions? AC has a Driftwood Gray color. Make sure to let your new wood weather and prep.